As a species, we have evolved into killing machines extraordinaire. For us, killing is not just a matter of self-preservation, an instinct shared by all creatures that defend themselves with whatever weapons nature has blessed them with—poison, horns, incisors or claws. Armed with a supernatural arsenal, we now don’t merely disable or kill; we aim to annihilate, be it termites, weeds, mosquitoes, cancer cells, or, going by Trump’s “fire and fury” bluster, even fellow human beings. Antibiotics are part of that arsenal and were designed to annihilate bad bacteria. Whenever we fall sick, doctors order them as a matter of routine. We are duly advised to complete the course, which usually lasts in multiples of five to seven days, lest some bacteria survive the attack, and mutate, thereby becoming immune to the drug. Not sticking to this dogma, according to the medical establishment, is one of the reasons behind the crisis of antibiotic resistance. Intriguingly, it now turns out that this widely-held dogma has no scientific basis. In a recent edition of the British Medical Journal, medical researchers at Brighton and Sussex medical school claim that “the idea that stopping antibiotic treatment early encourages antibiotic resistance is not supported by evidence, while taking antibiotics for longer than necessary increases the risk of resistance.” The heretics believe we are better off opting out the moment we feel better. This heresy does have some backers, but not yet large enough to inspire a paradigm shift and make doctors change tack. Meanwhile, the crisis of antimicrobial resistance (AMR) continues to spiral from grave to critical. According to The Review on Antimicrobial Resistance commissioned by the UK government, by 2050, every year, AMR is likely to claim 317,000 lives in North America, 390,000 in Europe and over 4 million in Asia and Africa. Apparently, the situation is so grim that researchers have painted apocalyptic visions of an “antibiotic winter” in which it will be almost impossible to do chemotherapy, organ transplants or C-sections, not to speak of treat deadly infections such as gonorrhea, meningitis, and typhoid. Last December, when news of bacteria resistant to the antibiotic colistin, apparently the last resort against multi-drug resistant bacteria, broke out, it filled researchers with dismay and dread. Portents for India are particularly ominous as it is the world’s largest consumer of antibiotics. According to a study published in The Lancet, in 2010, India consumed about 13 billion units, followed by China’s 10 billion, and the US’s almost 7 billion units. Worryingly, in the absence of rigorous studies and data, we don’t even know how strong or large the enemy is. As if this isn’t scary enough, we have very little idea about how much antibiotics is consumed by the global dairy and meat industry. According to one estimate the US pumps 80-90 per cent of all its antibiotics into farm animals for the single purpose of fattening them! Apparently, China is an even greater offender— researchers believe that the bacteria strain resistant to colistin came from a Chinese pig farm, while the EU, which outlawed this practice in 2006, is finding it difficult to enforce the ban. So If we add to this toxic pool antibiotics that leak into drinking water as industrial and domestic effluents (treatment plants can’t screen them), or those that leak into our meat and milk through farm animals, it would be fair to say that we are all dunked in a thick soup of antibiotics. Little surprise then Darwinian logic should kick in and select for resistance. This sounds like a horror sci-fi movie in which antibiotics are made to appear almost like Trojan horses. And yet, about 75 years ago, when penicillin, the first antibiotic, was made, these wonder drugs were hailed as a panacea that would deliver humankind of all sorts of pestilences. Earlier, in the late 19th and early 20th century, germ theory—the outlandish idea that diseases were exploits of some wretched critters so small we couldn’t even see them—inspired pioneers like Louis Pasteur, Joseph Lister and Robert Koch to take on bacterial scourges that had wiped out millions around the world. Between 1918 and 1919, the Great Spanish Flu engulfed 500 million people, and liquidated between 20 million and 40 million. However, while this campaign did bring about a sanitation revolution, thereby erecting a first line of defense against an invisible enemy, scientists still had no idea about how to slay it once it had laid siege. They tried everything they could—poisons, dyes, and toxic metals—to spot and kill the bacteria, but in vain, until Alexander Fleming stumbled upon the bacteria-killing ability of common bread mould, out of which he extracted penicillin. Before long, scientists were farming antibiotics from fungi and bacteria, which triggered the antibiotic revolution. Such was the euphoria about these wonder drugs that doctors believed they could cure almost any ailment without the collateral damage that went with many other potent medicines. So even as they saved millions of lives, indiscriminate and overzealous use eventually gave rise to phalanxes of mutant germs that defied ever-potent formulations. Look at it this way. For millions of years, germs—bacteria, fungi, and algae—have been trying to outwit one another in a Darwinian struggle for existence. In this never-ending arms race, not only have they acquired chemical missiles called antibiotics, but they have also evolved self-defense strategies. In 2011, scientists stumbled upon 30,000-year-old bacteria lurking under permafrost in Canada’s Yukon province that defied modern antibiotics, suggesting genes bestowing resistance to antibiotics have existed since ancient times. So does this mean we are not guilty of inciting antibiotic resistance? Not entirely. As the American microbiologist Martin Blaser writes in his dystopian yet sobering Missing Microbes, “although resistance is ancient, we have made it a lot worse. We don’t even know how many orders of magnitude…[but] even ocean life shows evidence of the spread of resistance from our activities.” That antibiotic resistance is of ancient vintage also suggests that resistance is inevitable, and that any dream of a panacea against microbes is bound to shatter. As worrisome as antibiotic resistance crisis is, some scientists believe that the abuse of antibiotics might even be behind the rise of modern plagues such as autoimmune disorders, juvenile diabetes, autism, obesity, food allergies, and a bunch of mysterious intestinal disorders, all of which defy scientific explanation. According to this hypothesis, such derangements happen when large colonies of innocuous bacteria are bumped off as collaterals in the scorched-earth assault of antibiotics. For, these bacterial swarms, which cover every millimetre of our bodies (picture this: against 30 trillion cells in the human body, there are about 100 trillion bacteria, collectively called the microbiome), inside as well outside, act as useful and efficient butlers performing key roles in the body’s immune, metabolic, and cognitive faculties. Clearly, the genie is out of the bottle, and it won’t be easy putting it back in. 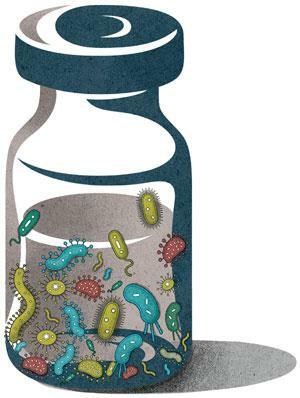 Pharmaceutical companies do not want to invest in new antibiotics, as returns are only modest. Governments are doing their bit, like our own draft National Action Plan on AMR, to prevent the abuse of antibiotics through awareness campaigns, devising tests that can tell if a patient needs them, and hunt for new ones. However, given the scale and complexity of the AMR crisis, this may not be enough to inspire hope. For a start, governments can follow Denmark’s example by eliminating antibiotics in the meat and dairy industry.